I love the colorway you used on the cards. Great blues! Beautiful cards! I just bought the Art Philosophy cartridge and can’t wait to use the snowflake cuts! Both of these are lovely! Such a pretty and cool color combo. Very winters! The liquid pearls add such a nice finishing touch too. Lovely wintery cards! I love the colors you chose and the little bit of pearl pen adds just the right finishing touch. Elegant and pretty! Great cards!!! Beautiful soft colors! Thanks for sharing. I love the pretty blue colors you used on both colors and the liquid pearls for dimension. The snowflakes from the cricut cartridge are just so pretty!! Such an icy wintery feel to these cards. Feelin’ like a little hot chocolate and some card time is in the works…too bad it is gonna be 100 degrees here today. Thank you for wintery feeling in these beautiful cards. Very elegant. I agree with Sandy, the color palette is beautiful! Love the snowflakes and the soft colors. Anyone would love to get one of these cards. Really pretty colors on your cards. Very elegant and soft winter cards. Love pearls! Love yoursoft colors and the snowflakes. Nice sentiment too. Beautiful card! Such pretty cards– love the colors you selected and the snowflakes are great. Thank you so much for your support of OWH! I love your cards! Such pretty colors and love the added pearl pen! I love how you used the liquid pearls to all bling to your cards. Well done! Great card! Love those cricut cuts! I REALLY like blue cards for Christmas/Winter. These are very striking. I think both cards are stunning; TFS!! Love the colors and your use of liquid pearls on the snowflakes …very pretty ! Lovely! I love that stamp set and cartridge. . . Your colors are beautiful too. Well done!!! Thank you for joining us today! I love the colors on these cards. Really beautiful! Such pretty cards and so soft looking! Very pretty! You color choice makes these really nice and someone is going to be so happy to receive them! oooh, those liquid pearls are so pretty! I don’t have any/haven’t used them before, but now you’ve got me interested in them! thanks! I love how elegant your cards look. the color scheme is beautiful. Love how your patterned papers work so well together! 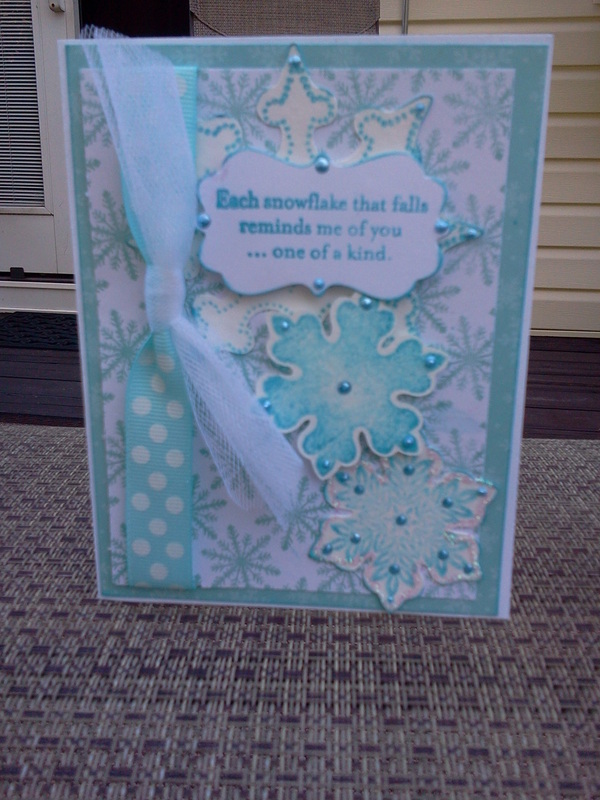 Beautiful cards – love the blues and those snowflakes! LOVE the snowflakes and that you accentuated just one on each. Happy WCMD! 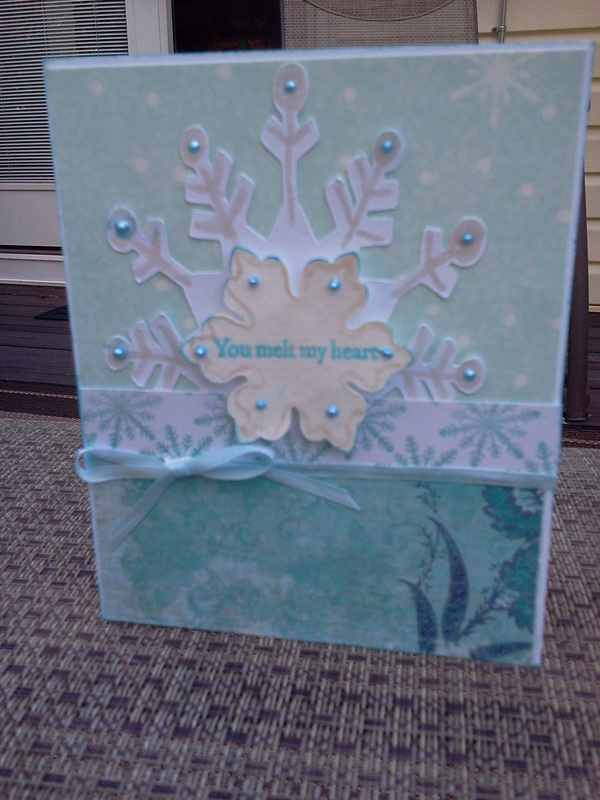 You cards are gorgeous and what stands out for me is the beautiful background snowflake paper. Beautiful cards!! I love the liquid pearls on them!! Gorgeous cards!! I love the soft colors and the touches of liquid pearls is perfect! Both of your cards are just lovely! The liquid pearls add a nice touch along with the popped up snowflakes. Beautiful snowflake cards! I think you chose just the perfect colors for both of your cards. Very , very pretty. I especially like the sentiment on the first card. I really like those sentiments. They can be used for so many things! Beautiful colors! TFS!! Lovely snowflake cards–I like the paper you used and the liquid pearls. Great cards…love the colors, layers, and sweet details! tfs!! !